More and More Christmas cards, yes! .... maybe some of you are bored with Christmas cards, but not me ;) I love all that has to be with this holiday and I know that maybe is to soon to fill my blog/Etsy shop with this card theme but what can I do if I love them? anyway these are just a few cards that I love lately! For this card I use one of my favorite papers from Melissa Frances: Reindeer games, the red paper is from my stash (do not know who makes it), I use one big stamp from Tattered Angels, some glimmer mist, brad from K & Company, ribbbon, lace and rub ons from my stash to. Next another favorite. 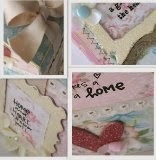 Here I use some paper scraps and one of my favorite vintage images, chipboard from Melissa Frances, stamps from SEI, and a brad made with fabric. Your work is just so elegant and classy - I love all of it! The "Howls" card is my favorite! Gorgeous work! Ooh that Christmas card is SO pretty! I love them both though! your creativity is just amazing, love it. Están preciosas las cards navideñas, me encantaron. Oooh! 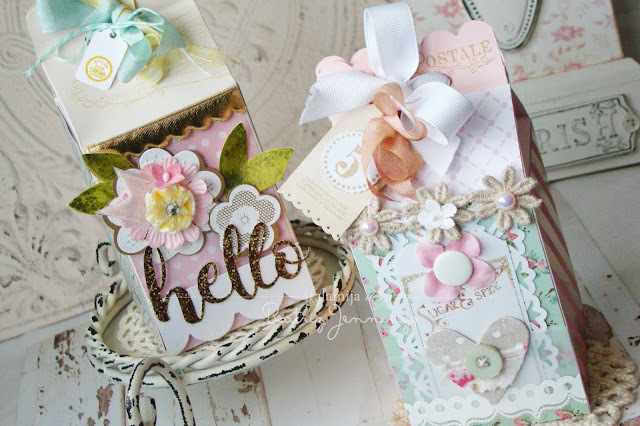 such beautiful cards - I never tire of seeing what you do.